The Miami Rum Renaissance Festival is well organized by virtue of a systematic set of deadlines and logistics to manage the myriad steps necessary to ensure success for all involved. Please follow these deadlines in chronological order. 1. 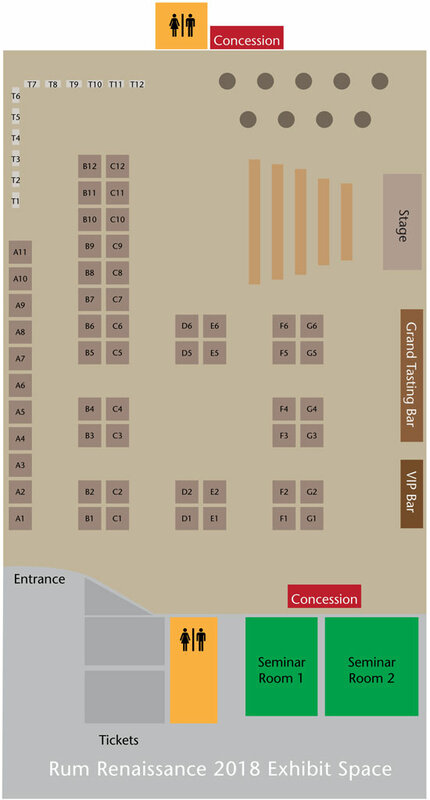 Choose your preferred exhibit space(s) using the exhibit space diagram. Make sure to indicate if you need, chairs, etc. 2. Calculate your exhibit space and number of expressions using the Exhibitor Package. Return to Robin Burr with final payment in full on or before Friday, March 15. 1. Final Payment for Exhibit Space is due before proceeding further. 2. Register all your expressions to be exhibited at the rum festival. Here is the product registration submission page link. All registered products will have their bottle photos included in the show program. All registered products can be entered in the RumXP international blind tasting completion if received before the deadline. All products must be registered before Friday, March 15. 3. Submit your publication-quality advertisement via email to Robin Burr for the printing of the Rum Festival Show Program by Friday, April 6. 4. Submit publication-quality photos of all your registered bottles to Robin Burr for the Rum Festival Show Program by Friday, April 6. 1. Sponsored Seminars are available on a limited first-come first serve basis. The deadline for submitting all details and confirming your seminar is Friday, March 22. 2. Reserve your Fam Meeting with rum judges. A limited number of private breakfast and lunch meetings with the rum judges are available to exhibitors for the purpose of presenting new products, briefings, etc. Reserve early to guarantee this opportunity. Arrangements for familiarization meetings must be completed before Friday, March 22. 1. Reserve Hotel rooms. The hotels are offering discounted room rates for exhibitors. Check the rum fest web site for details. 2. Ship two bottles of each registered expression for the international rum tasting competition, arriving on or before Friday, April 19. The address is 18500 SW 244 Street, Homestead, FL 33031. 1. Provide the names of persons that will be working in your exhibit space. Badges will be provided for these persons at the event. The deadline for providing exhibitor names to Robin Burr is on or before Friday, April 26. 2. Get your trade passes. Exhibitors are entitled to a discount on trade passes for their associates in the spirits industry for $25 each. All registered exhibitors must order their discounted trade tickets via email before Friday, April 26. 1. Portion Control and Security details are listed in the Exhibitor FAQ. Please advise all exhibit staff of these details to ensure compliance with exhibitor rules and regulations. Please advise all exhibit staff of these details to ensure compliance with exhibitor rules and regulations.